When photographer Markus Lehr moved to Berlin from southern Germany in 1982 he brought with him memories of his father's keen interest in photography. Remembering as a child his fathers Voigtländer Bessamatic together with its impressive collection of lenses and filters that he used to carry around in his old leather bag. Later as a teenager, Markus was allowed into the darkroom of his father's camera club and a whole new and exciting world was revealed. The baton was passed and although Markus shot regularly from then on, it was not until three years ago whilst trying out night photography that a true and meaningful fascination with photography emerged. Since then his photography has evolved, now specialising in urban images that reflect an unseen human presence and relationship with the city’s often forgotten and unused places. The topography and elements of his work by being ubiquitous and commonplace tell stories without necessarily setting them in a time and place. 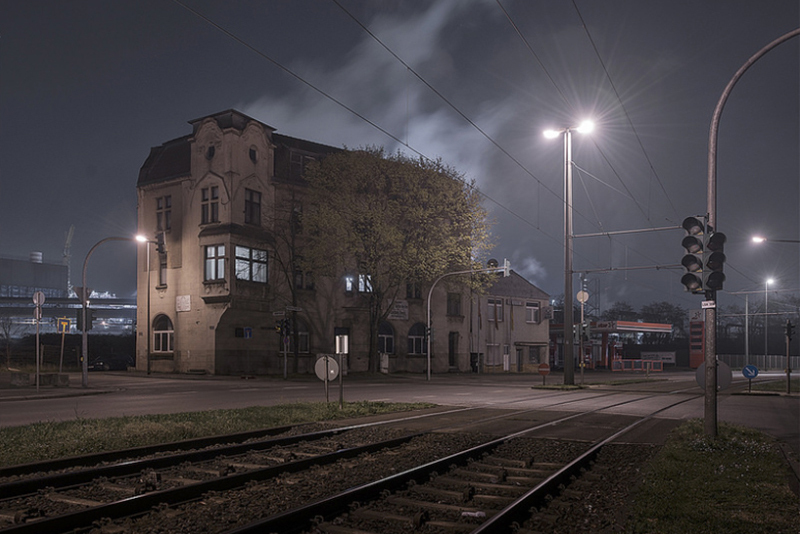 One of Markus’ most recent works ‘Notes from the Rust Belt’ features long exposure night work of the Ruhr’s industrial areas in western Germany, this project exemplifies his current work and gives us a chance to explore further his photographic thinking and influence. • Markus your focus is very much on topographic landscapes, human involvement is ever-present but only implied, can you tell me a bit about your interest in this area and how it may have evolved from your photographic beginnings? I guess what I’m interested in is how you came to develop this style. I guess in the beginning it was quite logical that there were no people in my shots. I needed to concentrate, so I intentionally selected calm places to explore the long exposures I was interested in. After a while I noticed the power of this "peoplelessness" and I began to realise that even without any humans within the frame the scenes were still talking about us and the relationship we have with our environment. I began to focus on that further. Another source of inspiration was my love for arthouse movies. Especially Antonioni's Desserto Rosso and "Blow up" influenced me tremendously. This brings me directly to your next question. • You seem to have a fascination with stillness and the dark, the majority of your work is photographed at night can you tell me why you chose to work during these hours? There is a scene in Antonioni's "Blow up" where the main character is situated outside an empty tennis court. We hear the sound of a ball being played but we see nothing than the empty field. Everything happens in the head of the main character. I think I would be happy if my images could achieve an effect like that. So much for the stillness. About the night: The simple answer is that I can concentrate and focus easier in the quiet places where I am shooting mostly. I guess it has a lot to do with wanting to control the result. The cinematic approach may also play a role. • I notice that colour plays a key roll in your compositions, what is your feeling about colour and it’s roll in your work and have you every worked in mono? I love colour, the many fine tones and feelings you can express with colours. I would miss those possibilities if I would restrict myself to black and white. Colours are also playing a big role in creating the atmosphere and feeling of a scene. For me it is more a whole thing, it adds the real life which is in between black and white. I don't mean the shouting colours, the more I explore this path the more I prefer the dimmed ones. Very close to grey or white or black but with a little tone. Maybe this is a continuation of my search for the quiet places. I did work in black and white earlier on and I was sometimes tempted to do night shots in black and white but then again, whenever It tried it I didn't find the results satisfying. • Your latest series Notes from the Rust Belt is associated with the post industrial decay and economic loss in many Northeastern states of the US. Is this a term used in Gemany? The term isn't used in Germany but as the Ruhr area faced a very similar fate compared to those states in the US, I thought it would be a good idea to set the tone for the series with this title. • You are from Berlin, what is your association with the Ruhr in the far west. Notes from the Rust Belt with it’s big sky and expansive landscapes is set apart from some of the more intimate images of small huts, vehicles in your other work. Is this a conscientious thing or just a consequence of the locations? As a young boy I was fascinated by stories about spacecrafts and friendly aliens coming to visit us. 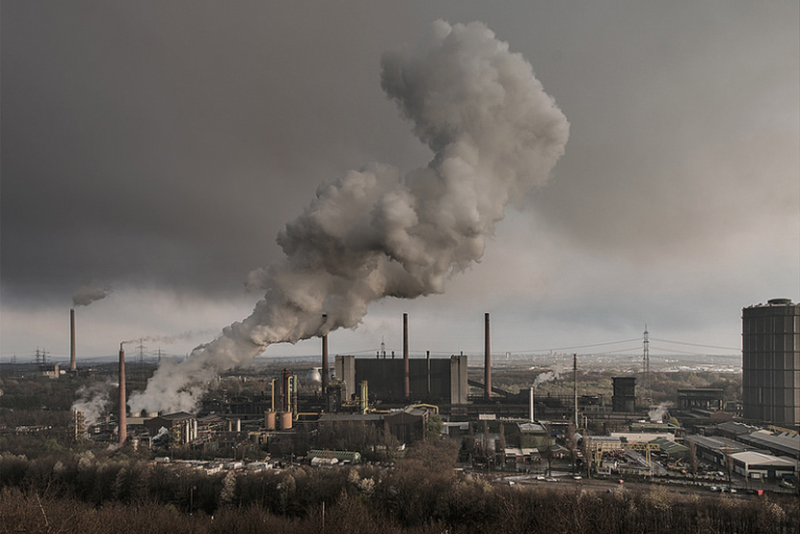 The Ruhr area is full of old industry of the last two centuries. Unlike Berlin you find a lot of those places relatively intact. Going there meant a bit visiting my childhood dreams. Now I am not that boy anymore and a lot of those childhood dreams didn't materialise and so while I was there the images I captured oscillated between that fantasies of the young boy and the melancholy of the grown-up person. The places are empty now. Nobody works there any longer. "Everybody moved to the new world" like I titled one of my images. I don't see this as a loss only. It is a new beginning as well and you can feel it there a lot. I hope I succeeded saving that sense of wonders a bit. • How long did it take to complete the series? I was preparing the trip, finding out about the locations for a month roughly. The shooting time was four days and nights. And then it took me another month and a half to select and process the images. • Can you tell me about your plans for your next project? I hope I will have the time to do a series about my home region, Franconia, later this year. This would be kind of a complimentary project to 'Notes from the Rust Belt'. It would be a rural area vs. a highly industrialised one and an area I have known since childhood vs. a place I have never been to before. I am planning to focus on the detached countryside aspect, the small villages and the earthy and dark green tones vs. the concrete and steel and iron tones of the Ruhr area. I have a few other ideas in mind like a series about workplaces. I occasionally shot images with this theme in mind already but never really focused on it. It is exciting going out and coming home with a bag full of images to explore. Sometimes the idea for a new series materialises while I am working on an image. So who knows what's around the next corner. This blog is meant as a way to interact with visitors but primarily a way to show and promote the work of other photographers who's work I admire. See I was once told by a brilliant photographer who worked for the British papers in the 60's and 70's that 'if you want to get good at this thing [photography] then you have to take lots of photos and look at lots of photos'. Everyday I see work that inspires me and here is my chance to say why.